It’s been a long time since I’ve updated my blog due to divorce, moving house and working a new job full time. I’m living on my own again in a small house where I don’t have a lot of space to work on my art. My mind’s been busy with a lot of other stuff I had to get out of my system first to find peace and quiet. The peace and quiet is nearing, but is not complete yet. In time I will find it and start my art again. I’ve been encausticing and drawing a bit already, but not as much as I did. So, now you all know what’s been going on in my life (in short). Hope all is well with you all and to see you soon! 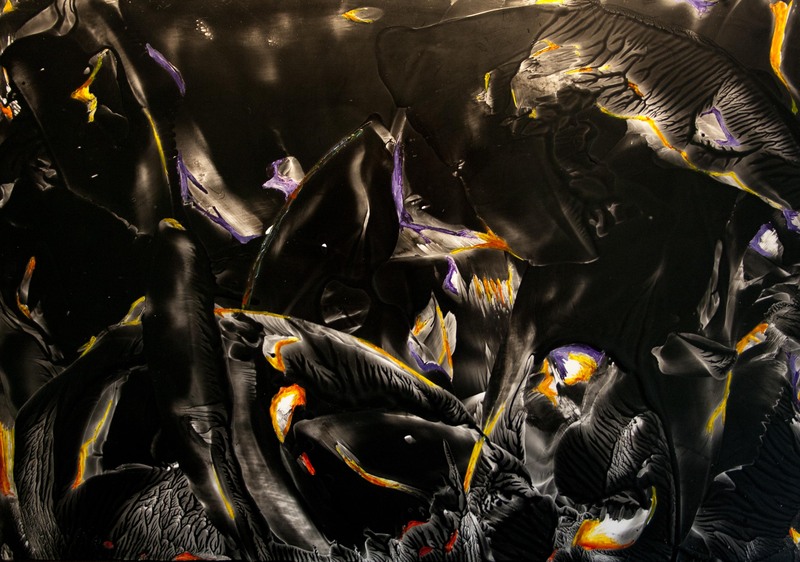 This entry was posted in Encaustic Art and tagged black, divorce, encaustic art, house, moving, time. Bookmark the permalink. God Bless You! Keep going with your Art! Your work is great! It is just a matter of time, I believe. Everything will be fine! Time is the best doctor! I am looking forward to see your new projects! What I found lying amongst the: – Forests of shadows, reach out across the sides of mountains, horizontal, climbing their way towards summits, one could be forgiven for pondering they might be deep carved gulleys, or a riddle of veins beneath the surface to black leaves, Perhaps they are black leaves from last Autumn, waiting for Summer rains to fall upon them beneath Spring’s new fresh green foliage, as climbing wild flowers stretch out to part their spaces, between these black leaves in decay, bursting with purples, oranges and reds, like a summer’s morning in a far north, while forgotten breezes gently kiss their cheeks in a silent loud moment where new stories begin… What I found lying amongst the black leaves.